Pleased to meet you. My name is Rebecca P. Barnes Proctor, or Becca for short, and I am the sister of James Buchanan Barnes, friend to Captain America. 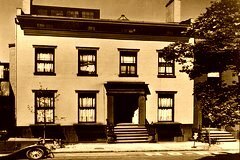 I currently live in Brooklyn, New York in the early 1940s. In the comics, my older brother was born in Shelbyville, Indiana in 1925, and we have no other sisters, but in the talkies he is born in Brooklyn in 1917, and we have two other unnamed sisters. Actually, I’m not named in the talkies either, but I sure hope to be. So I can have two sisters, Evelyn “Evie” and Georgia “Georgie” Barnes. Also in the comics, my late parents were George and Winifred Barnes. They died after 1936 in the talkies because in a flashback, Bucky tells Steve “my folks wanted to give you a ride to the cemetary,” and Steve’s mother died in 1936 in the talkies. My grandchildren are Scott and Kimberly Proctor, so I must have had a son. My late aunt was Aunt Ida, and one grandmother was a Hubbard. To include the alternate universe with Rikki Barnes, I have an uncle and aunt, Frank and Mary Barnes, who have Rikki and John Barnes. George Barnes - a military man in the comics, I’ve made him a piano teacher, tuner, and music seller in England and in America until the Great Depression, when he lost his jobs, deserted the family briefly, then returned when he got a job through the WPA at the Brooklyn Navy Yard. Winifred Barnes - she loves musical comedies, singing, cooking, and dancing. I look an amazingly lot like her as I am using the actress Winifred Barnes’ avatar. Through rigorous internet research (not really), I found a George Barnes and Winifred Barnes who arrived in the United States in 1907 on the good ship Caronia. RMS Caronia (1904) not to be confused with a later one. This one was scrapped in the Great Depression. Winifred Barnes is listed as coming from Bradford, England, which is in West Yorkshire, 8.8 miles west of Leeds. In the 19th century, Bradford manufactured textiles, was a center for wool, and had sided with Lancaster in the War of the Roses. James Buchanan Barnes - enough said. Rebecca “Becca” Barnes - Because I am Bucky’s only canon sister, I am close in age to him, two years off, in fact, and I was born in Shelbyville as Bucky was. We moved to Brooklyn later. I like tap dancing and playing four-hand piano with my mother or sister. I also like hats. Evelyn “Evie” Barnes - She born in 1925, and will go on to marry the brother of Connie, the woman seen with Bucky in Captain America: First Avenger (Jenna-Louise Coleman from Dr. Who). Georgia “Georgie” Barnes - Born in 1928 in Brooklyn. Through more rigorous internet research (or a quick peak at ancestry.com), I learned that lots of Barnes’ immigrated from Lancashire, England in 1891 and Dorset in 1881. By 1920, lots of Barnes’ did go to New York. So my parents immigrated from Dorset. Shelbyville, Indiana has lots of German immigrants, and Winifred sounds a little German, don’t you think? So we have German ancestry. And we have Italian, because that’s closer to Romania than the other countries and some fanfic includes Italian. Why Romania? Two words: Sebastian Stan. I lived in Brooklyn, New York, but I moved to New York City when the British fought the colonials. The Lenape used to live in all the land here, and they planted corn and tobacco and fished in the rivers. The town was founded in 1646 as the village of Brueckelen by the Dutch West India Company as part one of the five villages of New Netherland. Britain takes control of New Amsterdam/New Netherland in 1664, the Dutch win it back in 1673, and the British win it back in 1674. In 1683, there are six villages: Brooklyn, Bushwick, Flatbush, Flatlands, Gravesend and New Utrecht, which now define Brooklyn. July 9, 1776, New York declares its independence from Britain. June 1777, George Clinton is elected first governor of New York. On August 27, 1776, the Battle of Long Island, also called the Battle of Brooklyn or the Battle of Brooklyn Heights started. General William Howe led his British troops to victory, but General George Washington and his troops got away. (Howe landed on August 22, and marched on the colonists in Brooklyn Heights on August 27. The British outflanked the colonists, but Howe did not storm the redoubts at Brooklyn Heights, and Washington retreated to Manhattan by boat at night. Washington lost over 1,000, and Howe 400. While New York had a population of 25,000, over 30,000 fought in the battle, making it the largest single battle). September 15, 1776, the British occupy New York City and later set up twelve-sixteen prison ships/hulks in Wallabout Bay, where more colonial soldiers and civilians died than in all the battlefields in the war. Over 11,000 died on the ships, while over 8,000 colonials died in the war. Every day, dead bodies were thrown overboard (5-10 from the notorious Jersey alone) and washed up on the Brooklyn shore, where people gathered the full and patrial remains and buried them. Conditions were so bad aboard the prison ships that the dead weren’t noticed for ten days. There is a ferry between New York and Brooklyn, as the bridge is a century away. Red Hook has marshes. In 1780, the British built Fort Brooklyn in Brooklyn Heights along the east bank of the East River. November 25, 1783, after seven years, the British leave New York. Father George died in the war. Older brother: James, a soldier in the Revolution. James' friend is Stephen, also a soldier in the Revolution. Younger sisters: Evelina and Georgia. Currently, I am the daughter of Sir George Barnes, a haberdasher selling sliks and velvets who is rich enough to develop trade with Russia, import cloth to Spain and wine from Spain, help finance voyages of discovery, and enter politics. Maybe he’s interested in trade with the Ottoman Empire (Romania) too. He has been elected the Sheriff of London with Ralph Alleyn for one year, and was also elected the Lord Mayor of London for one year, after which he became a baronet. While he was Lord Mayor, his wife, Winifred, or Frideswide, was Lady Mayoress. He is still an alderman in Castle Baynard, the historic and financial center, which has St Paul’s Cathedral. My brother is James Barnes, Yeoman of the Guard, and Clerk of the Cheque (of the Guard). He keeps the checkroll with the names. He can be under suspicion by Henry VIII. My brother has a friend, Stephen Rogers, whose parents were Joseph and Sarah. He has an older brother, Anthony, who resides at Rogers Manor in Bradford, where Winifred/Frideswide was born, but Anthony has no dealings with Stephen, so Stephen’s on his own. However, he is Captain of the Guard, or maybe the Esquire of the Body. In his spare time Stephen likes to paint miniatures, which is considered the highest form of painting. He paints in gouache, watercolors, and enamel. When times get tough, he threatens to move to Ireland. (Historically, Rogers Manor in Bradford, Wiltshire, was built by Thomas Rogers, Sergent-at Law, who had a son, William, who had a son, Anthony, who had a son, Anthony, who had it during the reign of Henry VIII and died in 1583). 1885 - George is born somewhere in Cumberland, England (lots of Barnes’ there). 1887 - Winifred is born in Bradford, Eng.
? - George moved to Bradford. 1907 - George and Winifred Barnes arrive in the United States on the ship Caronia, from Bradford, Eng (W. Yorkshire, 8.8 miles W of Leeds, 16 miles NW of Wakefield). George is a piano teacher, tuner, and music seller. George is 22, and Winifred is 20. 1908 - Winifred has a miscarriage. 1909 - Winifred has a second miscarriage and is too hearbroken to try again. (The miscarriages are to account for no children during this period). The marriage is in shambles, and George stars frequenting the saloon. Later, the marriage improves. 1911 - Arthur Evans is knighted. Bucky - b. March 10, 1917 in Shelbyville, IN. Winifred is 30. Becca - b. 1919 in Shelbyville, IN. 1922 - Howard Carter discovers Tutankhamun's tomb. 1923 - William Matthew Flinders Petrie is knighted. January 24, 1925 - A total solar eclipse was seen in New York around 9 AM. The Barnes family was there scouting out where they would live, as it was a Saturday. Evie - b. 1925 in Shelbyville IN, right before they move to Brooklyn. (Later marries Connie Oswald’s brother. Bucky is 8, Becca 6). (Most adults may remember back to 6/6 1/2, especially emotional memories. Georgie - b. 1928 in Brooklyn. Bucky is 11, Becca 9, Evie 3. Winifred is 41. 1930 - Bucky meets Steve. 1930-36/40 - Dust Bowl in the United States. 1931 - George works half time. 1932 - George loses his jobs and deserts the family in shame. Bucky is now the man of the family at 15. Unemployment max. August 31, 1932 - New York experiences over 80% of a total solar eclipse. Totality was in Vermont, New Hampshire, and southern Maine. 1935 George finds work in the Brooklyn Navy Yard through the new WPA and comes back to the family. Winifred takes him back in. WPA - starts May 1935. October 15, 1936 - Sarah Rogers died. Steve is 18, Bucky is 19, Becca is 17, Evie 11, Georgie 8. 1911-1936 - Brooklyn Dodgers logo variants of a blue B. 1937 - George works on the USS North Carolina, which is laid down in Oct 27, 1937. USS North Carolina is first new battleship to enter WWII, was most decorated ship in WWII, now a museum ship in Wilmington, NC. Hull symbol BB-55. 1937 - the Hindenberg explodes. 1938 - recession, unemployment increases. In 1938, 1/3 of Brooklyn Navy Yard workers are from WPA. 1939 - Red Barber - Brooklyn lead radio announcer. General Manager Larry MacPhail introduces night games around this time. 1939 - Sutton Hoo ship burial excavated. 1940 - George dies in an accident at the Brooklyn Naval Yard Winifred dies within the year of a heart attack. Winifred is 53. Bucky is 23, Steve 22, Becca 21, Evie 15, Georgie 12. Statistically, should be cardiovascular. 1940, June 13 - USS North Carolina is launched. Bucky, Steve, and Bucky’s sisters attend. Jan-May 1942 - basic training? 1942 - Joins the 69th Infantry in the 27th Division in the defense of Kauai, because New Yorkers historically went to the Pacific Theater, not to Europe. Then he went to Oahu to begin training for island landings. There he learned his request to transfer to what was left of the 107th was granted…. they sent him to the 168th Regimental Combat Team (IA), part of the II Corps (i.e. they muffed it). Sunday, Feb 14, St Valentine’s Day - Feb 17, 1943. Sidi Bou Zid. 168th Regimental Combat Team received no desert warfare training but fought in the desert. At 1800 all ordered to withdraw to Kern’s Crossroads. American infantry were trapped on Djebels Lessouda and Ksaira. Private James Barnes led his section back and received commendation (ie he is on his way to earning his sargeant stripes for valor on the field). Feb 1943 - Battle of Kasserine Pass - goes badly, but Private James Barnes proves to be a leader. June 1943 - Bucky is on an unexpected and statistically inaccurate furlough around the time he becomes a sergeant, Becca moves up her marriage so he can walk her down the aisle. (The talkies show him in the States at this time). Bucky 26, Becca 24, Evie 18, Georgie 15. Evie is Becca’s maid of honor, Georgie is a bridesmaid. Bucky has a first dance with Becca, and a secret “practice” dance with Evie and Georgie, just in case. Evie and Georgie move in with Aunt Ida while Bucky goes to war. Oct 1943 - Bucky POW for a month. Jan 1945 - Bucky MIA. Becca is 25, Evie is 19 and has a serious boyfriend (but it’s not Ben), and Georgie is 16. March 1945 - Steve MIA.